TRENCIN, Slovakia — The Pohoda Music Festival is one of the biggest events in Slovakia, and this summer’s was no exception. Electronic music legends Kraftwerk headlined the festival, which also featured Tricky, Mogwai, Tame Impala, Suede, Goldfrapp and many others. The 30,000 concertgoers who attended the festival at Trencin Airport were treated to a diverse range of electronic, techno, hip hop, rock and other musical styles – and the best sound ever in the festival’s 17-year history, thanks to a HARMAN JBL VTX and Crown audio system supplied by Slovakian sound contractor Audio Line (www.audio-line.sk). Audio Line founding member Ladislav Demcak had been a long-time JBL user and before the start of last year’s summer touring season made the decision to make the move to JBL’s top of the line VTX Series line arrays after spending time in Belgium evaluating a VTX system with JBL’s Paul Bauman and “Big” Mick Hughes, front of house engineer for Metallica. “We could hear straight away that this was a very good system,” said Demcak. “I knew I had to have it – once I’d heard it I could never go back.” Demcak and his crew gave the VTX line arrays an “intense induction” with their existing Crown I-Tech HD inventory in 2013 over the course of some of Slovakia’s leading festivals including the Dobry Festival, Topfest, Terchovsky Budzogan, Lodenica and last year’s Pohoda Music Festival. 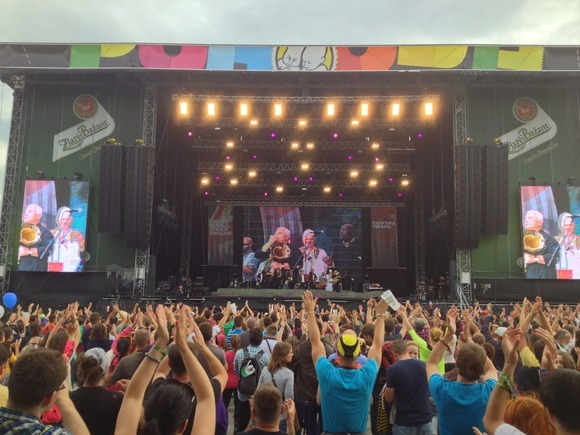 For this year’s event Audio Line equipped the Pohoda Music Festival’s main stage with two hangs of 14 VTX V25 fullsize line array elements and 10 S28 dual-18-inch suspendable subwoofers on either side of the stage with 12 additional G28 subs stacked on the ground in a cardioid array in front of the stage. Eight V25s provided out fill on each side of the stage and a pair of V25s were employed as near-fill loudspeakers. The loudspeakers were all driven by eight Crown VRack amplifier systems that each housed three of Crown’s I-Tech 12000HD amplifiers. In addition to the main stage, Audio Line furnished the sound reinforcement systems for four of the other seven stages at the festival. “Pohoda is the one festival where the sound quality had to be second to none,” Demcak pointed out. “Especially considering that Kraftwerk was headlining! We wanted the sound to be perfect.” Demcak applied all the experience and knowledge gained in more than a year of using VTX outdoors to tweak the system to maximum performance. One major advantage Demack and his team had over last year was that they used the latest version of JBL HiQnet Performance Manager™ software and VTX preset tunings, which enabled them to really dial in the interface between the VTX arrays and Crown amps and fine-tune a greater number of system parameters.